For your patients, hearing a cancer diagnosis can be frightening and confusing, but at Penn Medicine's Abramson Cancer Center, new strides have been taken to treat an uncommon sarcoma of the GI tract with a state-of-the-art team approach, and they have had significant results. I'm Dr. Shira Johnson. With me today is Dr. Ronald DeMatteo, who is Chair of the Department of Surgery and a surgical oncologist at Penn Medicine. Today we're discussing the treatment of GIST, gastrointestinal stromal tumor, with an incidence in the United States of approximately 4,000 to 6,000 cases per year. Dr. DeMatteo, welcome to the program. So, first, tell us about the background of GIST, and how does it present? Can it be detected early? So, GIST is usually a silent tumor unless it gets quite large. The tumor is often picked up in patients that just have very vague or subtle complaints. It might be found incidentally at endoscopy or laparoscopy for other reasons. It occasionally can cause GI bleeding, and that may bring it to light and lead to further diagnostic tests that then reveal it. Every once in a while a tumor is found that is quite large and has eventually caused symptoms of weight loss or greater abdominal discomfort. How was GIST treated historically, and how has that treatment evolved? The treatment prior to the year 2000 was primarily surgical, even for metastatic disease. A number of conventional cytotoxic chemotherapy agents have been tested over a 20-year period with really none of them working on a regular basis, so prior to the development of tyrosine kinase inhibitors, medical options were quite limited and largely ineffective. After the development of tyrosine kinase inhibitors, everything, of course, changed, and now we have combination therapies in the metastatic and the primary isolated tumor settings using surgery and drugs like imatinib or sunitinib. What was the hypothesis for believing that there would be a benefit of adjuvant therapy with imatinib, or Gleevec, in the treatment of GIST? So, when the first patient was treated around the turn of the century, there was a lot of excitement because, as I alluded to earlier, essentially nothing had worked previously for this disease. And imatinib was given to a patient, and that led to a conference at the National Cancer Institute of people interested in GIST to try to design what the clinical trial should be to prove that beyond the single patient that the drug was efficacious. And at the time, all the medical oncologists were focused on designing a Phase III trial for patients with metastatic disease, and I was at that conference, and as a surgeon I was very interested in potentially increasing the cure rate from surgery alone. So, that led to our hypothesis that perhaps giving the drug to certain patients after surgery would benefit them tremendously, and at the same time, the medical oncologists ran a Phase III trial, which eventually showed how effective the drug was and in such a high percentage of patients. You were the principal investigator on three national trials testing the benefit of imatinib following surgery for GIST. What did you, as a clinician as well as a researcher, learn from the outcomes, and what were some of the hurdles you encountered along the way? So, we've learned a tremendous amount, because the first adjuvant trial was started some 15 years ago, and all three trials have now been completed. What we've learned is that there's a select group of patients who have a very high chance of not being cured by surgery alone, and this is surgery just for the original tumor in the absence of any metastatic disease. So, the initial trial was a placebo-controlled trial, double-blind and randomized, that showed that taking one year of imatinib versus placebo after having the primary tumor removed led to a much higher recurrence-free survival rate. Essentially, one year of treatment resulted in a one-year recurrence rate of about 2% versus about 17% or 18% if the patients had taken placebo. This was a very dramatic finding and actually led to stopping the trial slightly earlier than anticipated. So, the dramatic difference between the two arms led to FDA approval of adjuvant imatinib in this country, and then subsequently, the European Medicines Agency also approved the use of adjuvant imatinib after surgery for primary GIST. A few other trials followed this. They were all from Europe. And the next trial compared one year versus three years of adjuvant imatinib, so no placebo control like our study had, and what was found was that three years was better than one year. Now, in both of these trials, what we learned was that when the patients actually stopped imatinib, at that point several, or a certain percentage, of the patients developed recurrence, and this led to the most recent trial where we, in a Phase II single arm setting, we took essentially 100 patients and said, well, let's just treat them for five years after surgery and see what the recurrence rate is in that circumstance. And this trial has confirmed what we suspected, was that imatinib in the adjuvant setting is not really curative and you sort of need very long, if not lifelong, suppression using the drug even for undetectable micrometastatic disease. Now, we're also much better at identifying who the high-risk patients are. We've constructed a nomogram that's available online to indicate or estimate what the likelihood of recurrence for any individual patient is. We published this in the Lancet Oncology several years ago, and we validated it in two independent datasets from other places in the world. So, we now feel like we have a pretty good idea of who should take postoperative imatinib to reduce the chance of recurrence, and we think in most cases that those patients really need to stay on it for long periods of time to avoid the risk of recurrence. If you're just joining us, you're listening to Medical Breakthroughs from Penn Medicine. I'm your host, Dr. Shira Johnson, and I'm speaking with Dr. Ronald DeMatteo, who is the Chair of the Department of Surgery and surgical oncologist at Penn Medicine. We're talking about gastrointestinal stromal tumors. Targeted treatment is state-of-the-art for treating cancer in 2017. Is there a role for other immunomodulators in the treatment of GIST? We think there is. So, we've been studying this for about 10 years now. We've completed a trial using a combination of imatinib and a drug called ipilimumab, which originally was an immune agent used for melanoma. There have been some additional drugs that have been created since that first drug that was used in melanoma, and one is called nivolumab. And in the laboratory we found that the combination of imatinib with an immune agent is much more effective than just imatinib alone, and this has led to some clinical trials in the country to try to validate this in human patients. We also discovered in the laboratory that a particular protein that has a very long name but goes by the acronym IDO, I-D-O, is produced by GIST tumor cells, and this might provide another opportunity to alter the immune system, because this particular protein, IDO, suppresses T-cells that infiltrate tumors. So, there's a number of exciting possibilities for immunotherapy in GIST, and many of these are now in clinical trials, so we think that some of them will be useful in human patients. It's widely known that Penn's Abramson Cancer Center takes a holistic approach to care for their patients. Tell us about the team that you work with every day. Well, sarcoma is an uncommon disease to begin with. Sarcomas are a group of tumors. GIST is the most common, but there are about 70 other subtypes of sarcoma. So, it's really necessary to be treated at a center that understands all the aspects of GIST, which is still relatively an uncommon disease. This involves having expert pathologists, expert surgeons, expert medical oncologists. We need the ability to look at the molecular composition of the tumor because that guides us into which of the drugs that we should use to treat the patients that have the disease. So, the interaction among all these specialists is really necessary to provide the optimal care and treatment for patients with GIST. As physicians, we know the results are not just demonstrated in the statistics. Can you share with us a case story where you feel you and your team made a significant difference in the quality of someone's life? Oh, sure. Since these drugs have been around for quite a while now, close to 18 years, we have plenty of unbelievable stories. One of the first patients that I used a tyrosine kinase inhibitor in combination with surgery is still alive and still disease-free, and the patient had a tumor about the size of a bowling ball that was a metastasis in their liver. And without the combination of the two treatments, the expected survival would have been in the 1- to 2-year range, and now the patient is close to 17 years later with no recurrence during all that interval, after having a very large operation and then was put on the drug postoperatively and remains on the drug to this day. So, these are stories that never existed prior to the year 2000, and now we have the ability to keep patients alive much, much longer. So, that's an incredible story. 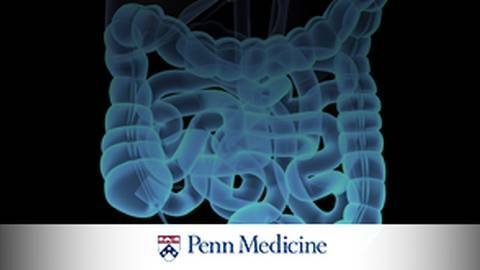 How can clinicians listening to this broadcast learn more about possible treatments for their patients with GI malignancies that are available to them at Penn Medicine's Abramson Cancer Center? Well, the best way is to go on to the website, of course. We have a lot of outreach talks that we give. There's a particular doctor that comes up on the website. Certainly, you can contact them directly. Our e-mails are listed. The phone numbers are listed. So, you know, our goal is to provide the knowledge that we have for all physicians in the country, not just in our locale. And again, for uncommon diseases, we'll often see patients come from great distances to gain the expertise and the experience of what we have here. So, the threshold is very low. We have nurse navigators. We have representatives of the cancer center. There are numbers on the website to call for new appointments if a patient wants to do so directly. Dr. DeMatteo, thank you for being with us today. My thanks again to my guest, Dr. Ronald DeMatteo, who is the Chair of the Department of Surgery and a surgical oncologist at Penn Medicine. We've been discussing gastrointestinal stromal tumors. 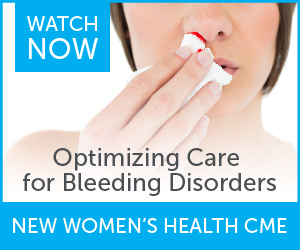 To access this episode and others in the series and to download the ReachMD app, please visit ReachMD.com where you can Be Part of the Knowledge. We encourage you to leave comments and share this program with your colleagues. Thank you for listening. You've been listening to Medical Breakthroughs from Penn Medicine. To download this podcast or to access others in the series, please visit ReachMD.com/Penn and visit Penn Physician Link, an exclusive program that helps referring physicians connect with Penn. Here you can find education resources, information about your expedited referral process, and communication tools. To learn more, visit www.pennmedicine.org/physicianlink. Thank you for listening. Ronald DeMatteo, MD, of Penn Medicine talks about diagnosis, treatment and research for the rare Gastrointestinal Stromal Tumor (GIST). 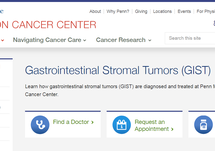 A Gastrointestinal Stromal Tumor (GIST) is a rare sarcoma that begins in the digestive tract or stomach, with an incident rate in the United States of approximately 4,000 to 6,000 cases per year. 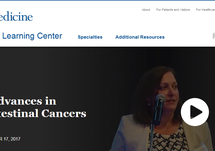 Since these tumors behave differently from other gastrointestinal cancers, they require a specialized treatment plan. Host Dr. Shira Johnson chats with Ronald DeMatteo, MD, FACS, Chair of the Department of Surgery and a surgical oncologist at Penn Medicine. They discuss the diagnosis, treatment and current clinical research of GIST. 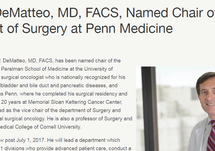 Dr. DeMatteo is a world-renowned surgical expert and researcher for the rare GIST. His research breakthroughs helped develop the new standard of care for GIST.